Oct. 26, 2017 -- As a high school student growing up in her native San Antonio, Celina Moreno can recall when half of her class did not cross the graduation stage with her. 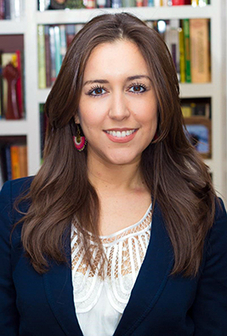 Moreno, a 2010 alumna of the University of Houston Law Center, said that memory fueled her desire to pursue a career in law, with a focus on improving the education system in Texas. She was recently named interim Southwest Regional Counsel of the Mexican American Legal Defense and Educational Fund, which was founded in San Antonio in 1968. In this role she is using public policy and the law together to push for change within the education system. Moreno knew before she attended UH Law Center that she wanted to work at MALDEF. "It is a dream job and one of the greatest honors of my life to be able to lead the Southwest office, especially now when Constitutional rights are increasingly under attack," Moreno said. "MALDEF is the leading defender of Latino civil rights in the country, and it's a special privilege to be able to lead an organization that started in my hometown almost 50 years ago." At MALDEF, Moreno has successfully represented DREAMers to defend against a lawsuit to invalidate the Texas DREAM Act and is currently co-counsel in a legal challenge against Texas' anti-immigrant Senate Bill 4 and in the Texas redistricting case seeking to protect the rights of Latino voters. Moreno worked as trial and appellate co-counsel in the challenge against the inequity and inadequacy of the Texas school finance system and is currently the lead counsel for MALDEF in a new school finance case against Texas, seeking to ensure that a few wealthy school districts do not receive tax breaks on the backs of the vast majority of the state's districts. "Texas constantly finds itself at the center of legal battles because it continues to pass laws that marginalize already-underrepresented communities," Moreno said. "As an organization, MALDEF seeks to ensure that these types of attacks on Constitutional rights don't go unanswered." Moreno has served as the co-chair for the Senate Hispanic Caucus/Mexican American Legislative Caucus Education Task Force and the statewide TRUST Coalition, a group of business, faith, civil rights and law enforcement leaders focused on immigrants' rights. She has also co-coordinated the Texas Latino Education Coalition and the Texas Election Reform Coalition, a statewide voting rights coalition. Before joining MALDEF, Moreno directed Texas RioGrande Legal Aid's School-to-Prison Pipeline Project. She received degrees in journalism from UT-Austin and in public policy from the Harvard Kennedy School. In her hometown of San Antonio, she was appointed to the mayor of San Antonio's Commission on the Status of Women and currently serves on the board of the Martinez Street Women's Center, a non-profit seeking to empower women and girls. Moreno was also recently selected as the 2017 Future of Texas honoree by the Center for Public Policy Priorities and one of twelve 2017 "Women of Distinction" by the Texas Association of Mexican American Chambers of Commerce. While attending courses at the Law Center, Moreno worked as a student attorney at the Immigration Clinic where she learned firsthand how the law could make far-reaching improvements in the lives of everyday people. She looks back on her law school years affectionately, especially the camaraderie and bonds forged over marathon study sessions. "The Law Center taught me so much and expanded my mind, but it was the late-night studying with friends that is the most memorable to me," Moreno said.